Safina's form has slumped since she was runner-up at the French Open in 2008 and 2009. (CNN) -- Last year's finalist Dinara Safina has been knocked out of the French Open in the first round by unseeded 39-year-old Kimiko Date Krumm of Japan. 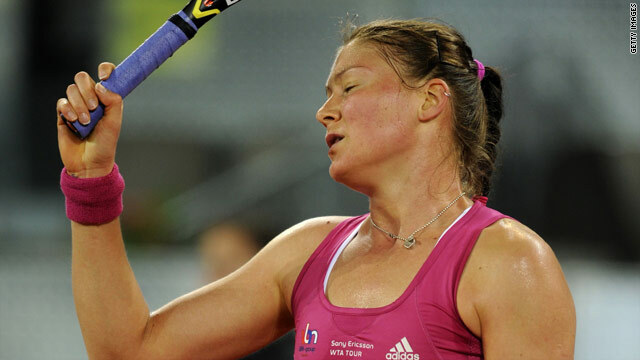 Russian former world number one Safina, the ninth seed, lost 3-6, 6-4, 7-5 in the biggest shock of the tournament so far. Date Krumm, who ended a 12-year retirement from the sport in 2009, had not played at the French Open since 1996. She becomes the second oldest women to win a match at Roland Garros in the Open era after Virginia Wade in 1985. "I should have closed it in two sets," Safina told reporters. "Then I just started to look at her instead of thinking what I was doing. I was more thinking about her than about myself, what I had to do. I lost the momentum." Meanwhile, four-time champion Justine Henin beat Tsvetana Pironkova of Bulgaria 6-4 6-3 to reach the second round. Belgium's Henin is competing at the clay court grand slam or the first time since 2007 after coming out of retirement in January. As soon as I walked in and was into the match, I felt a lot of things coming back. Pironkova started strongly and took a 3-2 lead before Henin found her rhythm to take control of the match. "I was feeling very happy just to be on center court. It's something I wasn't expecting again," Henin told the official WTA Web site. "From when I woke up until when I was walking onto the court, I didn't really know what to expect and how I was going to deal with my emotions. "At that time, I felt like I had never played on that court, even though I've played on it so many times. "As soon as I walked in and was into the match, I felt a lot of things coming back. It was fantastic to share this again with the crowd as once again they gave me great support." Henin, currently ranked 22 in the world, is on course to meet world number one Serena Williams in the quarterfinals. Elsewhere, Maria Sharapova beat her fellow Russian Ksenia Pervak 6-3 6-2, and Russian 21st seed Vera Zvonareva defeated Italian Alberta Brianti 6-3 6-1. Zvonareva will next play Shahar Peer of Israel, who beat Spain's Nuria Llagostera Vives 6-1 6-4.